I have Debian/Windows dual-boot laptop, and I want to re-install Debian on it, leaving the Windows partition untouched. Basically, I want to leave the specification for all the partitions the same. I just want the new Debian installation to completely overwrite the old one. No root file system is defined. Please correct this from the partitioning menu. If I select #5 or #6, the installer requires me to re-specify all the configurations for each partition, without telling me what their current settings are. Since I don't know how these partitions are currently configured, I cannot replicate these configurations from memory. 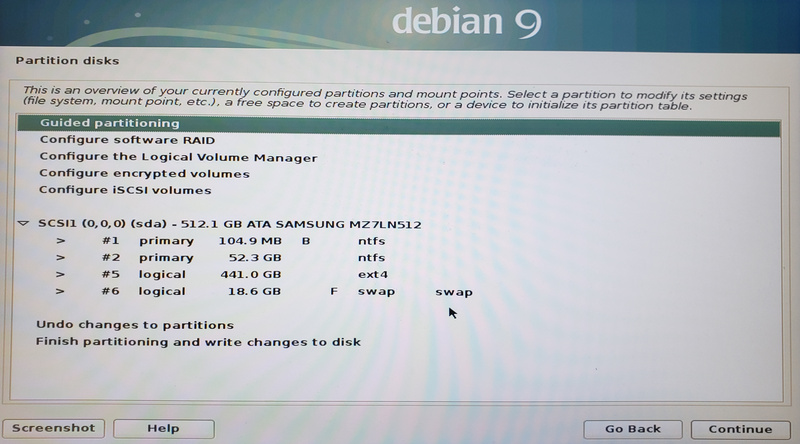 What steps should I follow to retain the partition specs as they are, and just overwrite the current Debian partition(s) (#5 and #6 in the listing above) with the new Debian installation? You need to assign mount point for your root filesystem. You should get another menu when you select a partition and click continue. Select partition 5, select "use as" and pick the file system type for your root partition (ext4 is likely a good choice, as it was use previously). Assign it the root (/) mount point. You should also format the filesystem instead of keeping current data, as remaining files from previous install could cause issues. Note that this will also remove all contents of your home directory (if you did not have a separate partition for /home). After configuring the partition for root filesystem, you should be able to continue with the installer. Not the answer you're looking for? Browse other questions tagged debian partition debian-installer or ask your own question. Is it possible to install GRUB from a Debian install disk to also support an existing WinXp/Win8.1 installation? Creating custom sized LVM partitions during installation (Debian)?